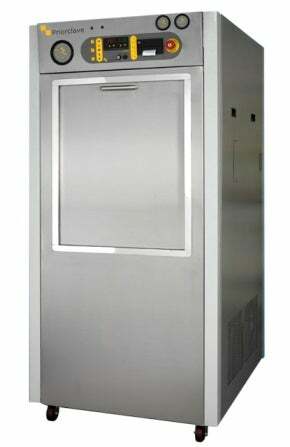 For laboratories with a requirement to sterilise large bulky items or that have a need for high throughput the perfect solution would be a high-capacity rectangular chamber autoclave, but where there is limited lab space conventional chamber door swing is a problem and for this reason Priorclave has introduced the RSV range of autoclaves. The big advantage of this rectangular chamber design, known as RSV PowerDoors, is that the chamber doors lower and rise within the body of the actual machine, eliminating the laboratory space normally required to allow for door swing, which is a factor with so many other autoclave designs. The RSV PowerDoor range is currently available in four standard chamber sizes, a mid-capacity range produced in two chamber sizes of 230l and 350l and two higher capacity autoclave models with 450l and 700l chambers. Push-button controls provide hands-free opening and closing of the vertical sliding door. Although easy access to the chamber is gained using the push-button controls, the inherent safety features prevent door opening during sterilising cycles and at high temperatures and pressures. A design advantage of Priorclave PowerDoor autoclaves is a fixed gasket onto which the door closes. When raised in line with the chamber opening, the door automatically moves forward directly onto the seal to create an air-tight lock. This closure action prevents undue wear on the fixed seal, improving long-term operational performance of these Priorclave autoclaves. RSV PowerDoor autoclaves are an integral part of a comprehensive range of standard steam sterilisers designed and manufactured by Priorclave from 40l to 700l with models including benchtop autoclaves, front and top loading floor standing autoclaves, vacuum autoclave models, and double-door models. The company is also able to produce autoclaves designed and built to meet particular requirements. Please contact Priorclave to find out more.